RSVP for I WILL LIVE: Suicide Prevention Webinar – UNITY, Inc.
Join UNITY in exploring how communities can support suicide prevention efforts. Bring your list of resources to share with others! At the end of the webinar UNITY will host a resource sharing Q&A session. 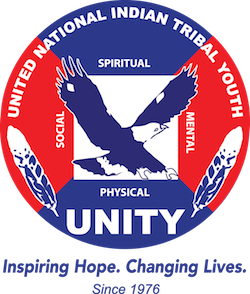 LorenAshely Buford, Oklevueha Band of Yamassee Seminoles of Florida, currently serves as the Project Manager over the national Wellness Warrior program with the United National Indian Tribal Youth, Inc (UNITY). LorenAshley is the current Principal Chief of her tribe and continues to be active in her state-recognized home community while working abroad. LorenAshley is a graduate of Arizona State University with a bachelor’s degree in American Indian studies and an emphasis in Federal Indian law and historical trauma. She has been a passionate advocate for prevention work focusing on the awareness of HIV/AIDs, prescription drug abuse, youth marijuana use, underage drinking and suicide among indigenous youth. Artistic expression, cultural inclusion, food sovereignty, youth empowerment and tribal community organizing are LorenAshley’s driving force and passions.